Shawna giving San Juan Hotshots directions on where they would attack the fire. Every month, USDA shares the story of a woman in agriculture who is leading the industry and helping other women succeed along the way. This month, we hear from Shawna A. Legarza. Shawna is currently the Director of Fire and Aviation Management for the U.S. Forest Service. 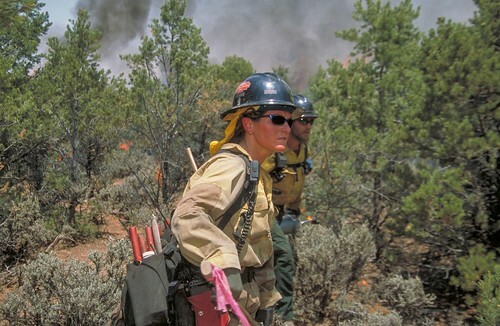 Shawna was raised on a cattle ranch in Northern Nevada and entered the firefighting profession as an engine crewmember for the Bureau of Land Management. 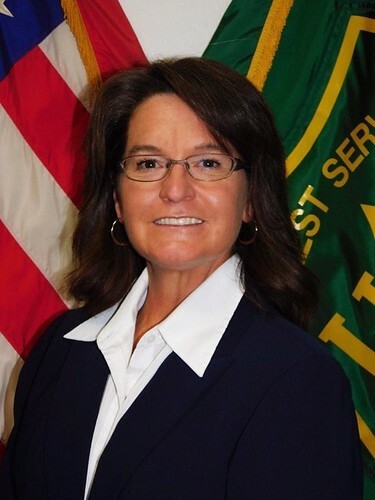 She has 29 years of experience in fire and aviation management and has held numerous leadership positions in a wide variety of regions for both the Bureau of Land Management and the USDA Forest Service. As a woman in ag, what does a typical day look like for you? The best thing about my job is that there’s no such thing as a typical day! As Director of Fire and Aviation Management for the U.S. Forest Service, I’m responsible for implementing and providing oversight on USDA and agency policy and making key decisions to ensure we are good stewards of the land, provide safe and effective wildfire response, make landscapes more resilient, and prepare communities adjacent to National Forest System lands to live with wildland fire. Since the U.S. Forest Service manages 154 National Forests and 20 Grasslands in 43 states and Puerto Rico, that requires me to spend a fair amount of my time in the field interacting with Fire and Aviation Management employees and supervisors, Forest Service line officers and leaders, Incident Management Team members, federal, state, tribal, and local government and non-governmental organization partners, and others interested in and impacted by wildland fire. When I’m in Washington, DC, I usually start my day by riding my bicycle to work. This helps keep me physically and mentally fit. My key responsibilities include briefing Forest Service and USDA leadership about wildfire activity occurring across the country and fire and aviation management issues; working with members of Congress and their staffs on fire and aviation management issues. How did you decide on working in the fire and aviation field? I grew up on a large cattle ranch in Elko, Nevada. I worked on the ranch as well as in our custom slaughterhouse. My family couldn’t afford to send me to college, so after I graduated from high school in 1988, I applied for and accepted a GS-03 Range Technician job on an Engine Crew working for the Bureau of Land Management. Shawna located at the Trinidad Complex in New Mexico. As a Hot Shot crew superintendent what did you do? The work ethic I developed as a young adult working on my family’s cattle ranch enabled me to be very successful as a hotshot. When I was the superintendent of the San Juan Interagency Hotshot Crew in Durango, Colorado, I was directly responsible for the lives and safety of my crew. We traveled all across the country working on wildland fires helping to protect citizens, homes, communities, and natural and cultural resources affected by wildfires. We also conducted prescribed fires and mechanical thinning to reduce fire risk and improve the health of National Forests. Hotshot crews are self-sufficient for 48 hours, meaning we carry our own food, water and supplies. 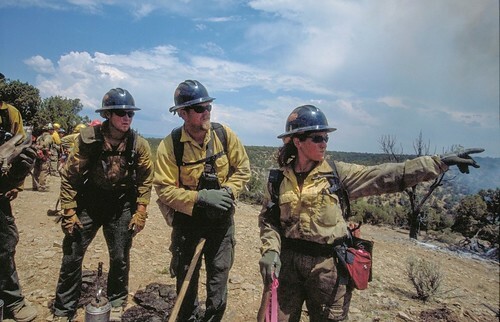 Hotshot crews are a specialized force of both men and women who work long hours often getting little sleep and going without creature comforts. We often work 16-hour shifts in steep, rugged areas in hot and smoky conditions, we sleep on the ground, we go for days without a shower, and we’re away from our homes, our families, and our friends for weeks and months on end. We pride ourselves in the work we do. Who do you think are the most influential women in agriculture -- past or present? I believe that within the Forest Service the most influential women are those who are leading change in difficult positions and stepping up in Fire and Aviation Management. The boots on the ground. We are seeing more women stepping up in leadership positions, like Engine Captains, Hotshot Crew Superintendents, Forest Aviation Officers, Incident Commanders, and a variety of other jobs. The people and the challenges we face as an Agency. I care deeply about the people who work for us and I want them to feel pride and fulfillment every day. In the end, it is all about how we take care of our people, we have always had tough departmental and agency challenges, and we will continue to do so, so we must take good care of our employees. The workplace environment is my number one priority followed by fiscal integrity and information technology. I aspire to the traits of transformational leadership and continuously working to be an engaged leader inspires me each and every day. How was it working during the 9/11 recovery efforts? That was one of the hardest assignments I’ve ever had. I worked the night shift and I helped identify items recovered from the “pile”. It was one of the most emotionally devastating assignments I’ve ever been on. The silver lining was that lasting relationships were made by sharing a very tragic experience. What advice do you have for young women interested in agriculture? Or what’s the best bit of advice you’ve gotten from someone? There are endless opportunities working in agriculture. It is a rewarding job and can include the opportunity to travel to amazing places that you would never otherwise go. There will be tough times, as in all careers, but power through and persevere and you will thrive. When I speak to all employees, the one thing I prescribe to them is to live in the present, don’t agonize over the past or fret about the future. Just be present, be patient, and bring in your perspective and you will be successful. A brief insight into a very special person. Shawna has done so much for the organization and is one of the most caring individuals I've met. The Fire Directors for the Forest Service have all been astonishing individuals and I rank Shawna Legarza at the top of that list. I hope someone one day writes a book about Shawna because she has done so much and touched so many lives. I applaud her skill and caring, she went on to get the college education she felt she needed and long past her fire career will be helping people achieve their potential.